A North Carolina man alleges that an NFL player attempted to seduce his wife. 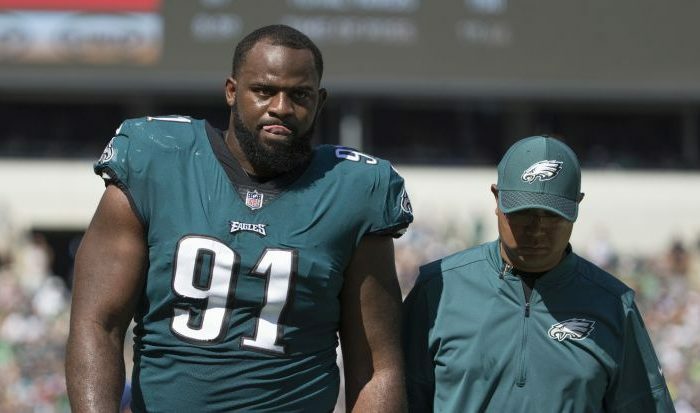 A lawsuit was filed against Philadelphia Eagles defensive tackle Fletcher Cox in the Mecklenburg County Civil Court on Nov. 22, the Charlotte Observer reported. Joshua Jeffords, the man, sued Cox for alienation of affection. Cox, 26, hasn’t responded to the lawsuit. Jeffords, of Huntersville, North Carolina, said that his wife met Cox during a work-related trip in Pennsylvania in April before she moved there in October, according to The Associated Press. Jeffords said he sought mental health treatment for “substantial emotional distress,” and he’s now seeking $50,000 in damages, AP reported. According to CBS Philadelphia, he discovered explicit text messages between Cox and his wife. Last year, Cox signed a six-year contract with the Eagles worth $102 million.